This week we saw a large drop in the number of Flipnotes posted about the weekly topic. I understand that many people are sad about Flipnote Hatena closing, and might have lost the motivation to post these days. I would like to remind everyone that Flipnote Hatena is not over yet! There is still time to have fun here, and we are looking forward to seeing your Flipnotes. Lastly, I would like to request that members of our community please stop posting petitions and unrelated Flipnotes to the weekly topic channel. Please only post your Flipnotes to channels that are related to the content of your Flipnotes. ★ Junjun (id:junkun123) posted this action-packed Flipnote about a space battle. The soundtrack is copyright-free music. The best of the last week's topic: "Spacecraft"
★ We liked this nicely drawn story about a young man and a rocket by KumaX (id:K8phux). ★ A young woman befriends an alien in this animation by doodler=!! (id:naruandpokefan). ★ Make new friends in space in this funny animation bySnowWhite (id:StickChic33). ★ What will happen next in this mysterious story by BlackCat™ (id:pichufan10)? ★ Check out the friendly spacecraft pilot in this Flipnote by Erin. (id:PerfectlyImperfect1367). ★ This is a really nice animation of a space shuttle by Joel (id:TornadoChaseJoel). ★ Take a voyage through space in this excellent animation by Licanka (id:Licanka). ★ Check out the milk rocket in this funny animation by DSITEROL (id:Classic-Angels). ★ We liked this funny story about a rocket by I am Dsi. (id:Citruskid). ★ Here is a cool Flipnote about a homemade spacecraft by ×TâsFïìàä× (id:toffee11). ★ Travel to a place far away in this neat animation by Ewilan (id:Pencora). ★ We enjoyed the fast action in this spacecraft Flipnote by Blackwing (id:xBlaxx). ★ A young couple tries to travel to space on an amusement park ride in this funny Flipnote by Johnny 3 (id:a3735963). ★ Animals and people enjoy space together in this animation by Asurapan (id:kaz872a). ★ This animation titled "The Mysterious Dagger" by Foo☆ (id:RAKUGAKINGU-suzu) plays back nicely in loop mode. ★ A young woman helps repair a damaged spacecraft in this Flipnote by Chisatota (id:LEGO-S). ★ Check out this realistically drawn spacecraft animation by LETROID (id:LETROID). ★ An alien makes a new friend in this neat animation by Aisu (id:sentimentaljourney). This week we would like you to post Flipnotes about picnics. Create stories about people enjoying meals outside, preparing foods for picnics, picnics in unusual places, or any funny picnic stories you can imagine. See where your creativity takes you! Please submit your weekly topic Flipnotes by 9:00 PM on March 28, 2013 (Thursday) US Pacific Time, and we will present some of our favorites on March 29, 2013 (Friday). 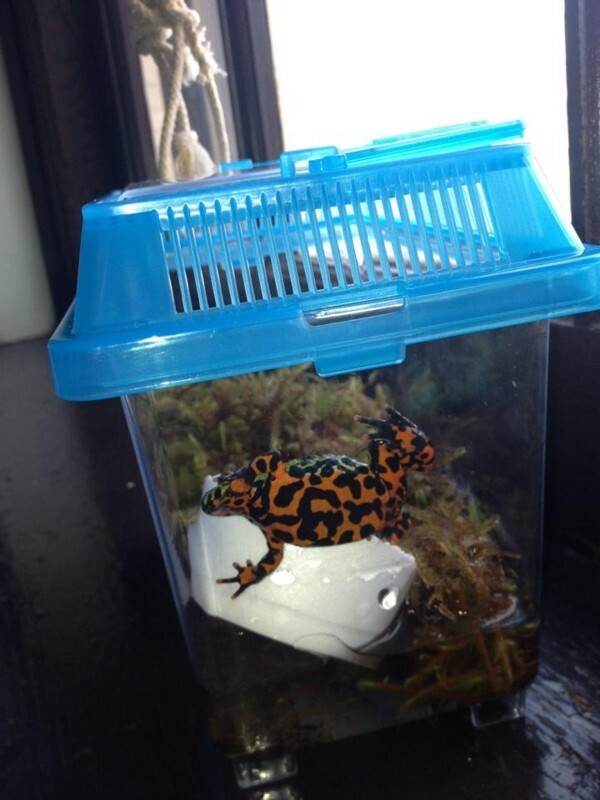 ★ blooberri (id:blooberri) posted this photo of a neat orange and black frog. 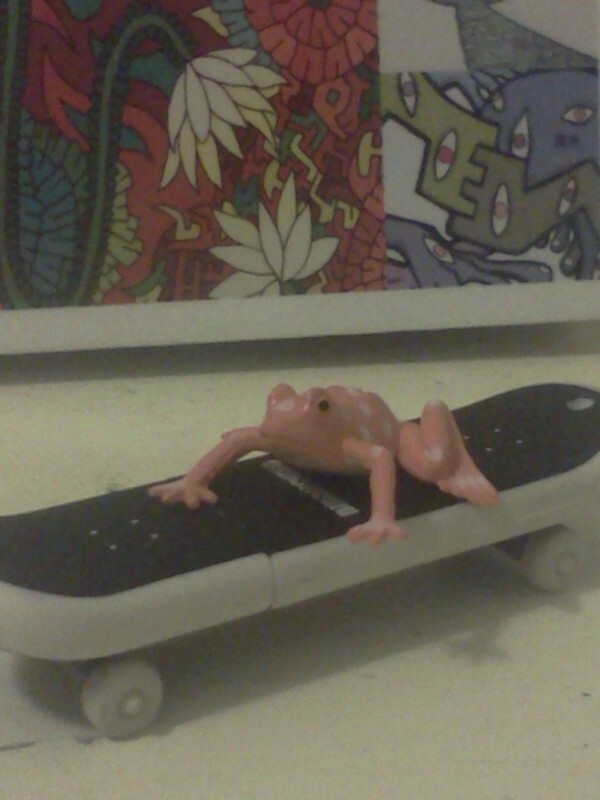 ★ Squishward (id:homestuck) posted this photo of a frog on a skateboard.